But there is never in Scripture liberty given to the human will as such: we are sanctified to the obedience of Christ. And this principle, our doing God's will in simple obedience without solving every abstract question which may be raised, is a path of peace, which many heads miss who think themselves wise, because it is the path of God's wisdom. The question therefore is a mere and poor sophistry which betrays the desire to have the will free, and a confidence that the person's judgment is superior to all that has been already judged. There is judicial authority in the church of God, and if there were not, it would be the most horrible iniquity on earth; because it would put the sanction of Christ's Name on every iniquity. And that is what was sought and pleaded for by those with whom these questions originated: that whatever iniquity or leaven was allowed, it could not leaven an assembly. Such views have done good. They have the cordial abhorrence and rejection of every honest mind, and of everyone who does not seek to justify evil. It is possible you may think or say, that is not the question I am asking. Forgive me for saying, I know that it is and that only; though you do not, I am well assured. But the judicial authority of the church of God is in obedience to the word. "Do not ye judge them that are within? But them that are without God judgeth. Therefore put away from among yourselves that wicked person." And I repeat, if it be not done, the church of God becomes the accrediting of every vileness of sin: and I affirm distinctly, that when this is done, other Christians are bound to respect it. There are remedies for fleshly action in it, in the presence of the Spirit of God amongst the saints, and in the supreme authority of the Lord Jesus Christ; but that remedy is not the totally unscriptural and miserable one proposed by the question - the pretension of competency in everyone who takes it into his head to judge for themselves, independent of what God has instituted. It is, taken in its most favorable aspect, not as individual pretension which is its real character, the well-known and un scriptural system which has been known since Cromwell's time-that is, Independency: one body of Christians being independent of every other, as a voluntary association. This is a simple denial of the unity of the body, and the presence and action of the Holy Ghost in it. Supposing we were a body of Freemasons, and a person was excluded from one lodge by the rules of the order, and if instead of looking to the lodge to review the case, it was thought to be unjust, and each other lodge was to receive them or not on its own independent authority, it is clear the unity of the Freemason system is gone: each lodge is an independent body acting for itself. It is in vain to allege a wrong done, and the lodge not being infallible; the competent authority of lodges and the unity of the whole is at an end: the system is dissolved. There may be provisions for such difficulties - all right if it be needed. But the proposed remedy is the mere pretension of the superiority of the recusant lodge and a dissolution of Freemasonry. Now I openly reject, in the most absolute way, the pretended competency of one church or assembly to judge the other as the question proposes; but what is more important, it is an unscriptural denial of the whole structure of the church of God. It is Independency, a system I knew forty years ago and would never join. If people like that system, let them associate themselves with it. It is in vain to say it is not that. Independency merely means that each church judges for itself independently of another. And that is all that is claimed here. I have no quarrel with those who, liking to judge for themselves, prefer this system; only I am perfectly satisfied that in every respect it is wholly unscriptural. The church is not a voluntary system. It is not formed (or rather unformed) of a number of independent bodies each acting for itself. It was never dreamed, whatever the remedy, that Antioch could let in Gentiles and Jerusalem not, and all go on according to the order of the church of God. There is not a trace of such independency and disorder in the Word. There is every possible evidence, in fad and doctrine insisted on, of there being a body on earth whose unity was the foundation of blessing in fact, and its maintenance the duty of every Christian. Selfwill may wish it otherwise, but certainly not grace and obedience to the Word. Difficulties may arise; we have not an apostolic center, as there was at Jerusalem. Quite true; but we have a resource in the action of the Spirit in the unity of the body, the action of healing grace and helpful gift, and the faithfulness of a gracious Lord who has promised never to leave us nor forsake us. But the case of Jerusalem in Acts 15, is a proof that the scriptural church never thought of, and did not accept, the independent action insisted upon. The action of the Holy Ghost was in the unity of the body, and is always so. The action directed by the apostle at Corinth (and which binds us as the Word of God) was operative in respect of the whole church of God, and all are contemplated in the opening of the epistle. Does anyone mean to pretend, that if he was to be put out at Corinth judicially, each church was to judge for itself whether he was to be received-that judicial act pass for nothing, or operative only at Corinth, and Ephesus or Cenchrea do as it liked afterwards? Where, then, was the solemn act and direction of the apostle? Well, that authority and that direction are the Word of God for us now. I am quite aware it will be said, Yes: but you may not follow it rightly, as the flesh may act. It is possible. There is possibility that the flesh may act. But I am quite certain that what denies the unity of the church, sets up for itself, and dissolves it into independent bodies, is the dissolution of the church of God, unscriptural and nothing but flesh. It is therefore judged for me before I go any further. There is a remedy, a blessed, precious remedy of humble minds, in the help of God's Spirit in the unity of the body, and the Lord's faithful love and care, as I have said; but not in the pretentious will which sets up for itself and denies the church of God. My answer to the question is, then, that the plea is a miserable sophistry, confounding infallibility and divinely ordained authority met by lowly grace; and the system sought by the question, the pretentious spirit of independency, a rejection of the whole authority of Scripture in its teaching on the subject of the church - a setting up of man instead of God. I am not very careful or anxious to answer the second question. It is clear that if two or three are gathered together, it is an assembly, and if scripturally assembled, an assembly of God; and if not, what else? If the only one in the place, it is the assembly of God in the place, yet I do object practically to taking the title, because the assembly of God in any place properly embraces all the saints in the place; and there is practical danger for souls in assuming the name, as losing sight of the ruin, and setting up to be something: but it is not false in the supposed case. But if there be one such, and another is set up by man's will independent of it, the first only is morally in God's sight the assembly of God, and the other is not at all so, because it is set up in independency of the unity of the body. I reject in the most entire and unhesitating manner the whole independent system, which is the only real object of the question, as unscriptural, and a positive, unmitigated evil. Now that the unity of the body has been brought out, and the scriptural truth of it known, it is simply a work of Satan. Ignorance of the truth is one thing, our common lot in many ways; opposition to it another. The miserable use, made by unprincipled persons, trying to make capital out of it, of an expression used with a perfectly right intention in London, I pass under the silence it deserves. The truth of God is the same, whether an expression used by Mr.--- be right or wrong. "We being many are one body: for we are all partakers of that one loaf." 1 Cor.10:17. We profess to be one body whenever we break bread; Scripture knows nothing else. And they will find Scripture too strong and perfect a bond for man's reasoning to break it. 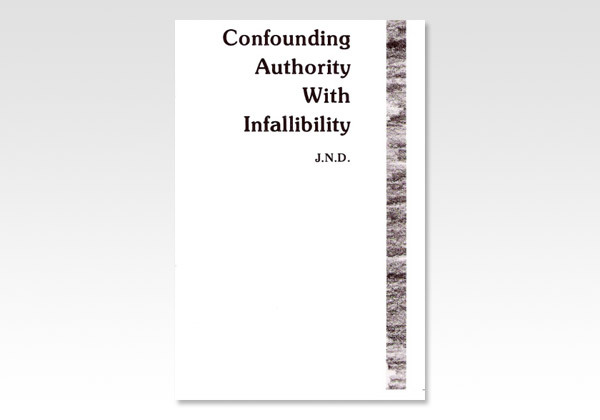 As regards what I said as to a higher claim of obedience, it is the safeguard against the exercise of authority where there is not infallibility. Thus Christ tells His disciples to obey the scribes sitting in Moses' seat; but when they tell them not to preach Christ, they cannot obey them, because God had told them to do otherwise. A parent's authority is sacred; he tells me (say I was a Jew) not to become a Christian: I disobey him because there is a higher obligation. It is important morally, because no departure or rejection of legitimate authority can be based on our own will or self in any way, but on the direct authority of God. Never have I a right, but I ought to obey. And it is simply that, if it be the authority God has given to a parent or magistrate, or whoever it may be, which leads me to obey them, as it is, it cannot be real when it calls me to disobey God's direct command. But obedience is always our path.